For ecommerce businesses, there are few better advertising tools and channels out there than Google and Facebook. With Google continuing to lead the industry in web (and paid) search, and Facebook continuing its powerhouse status as first-party data collector –– these two tech giants offer online businesses visibility and targeting that’s unparalleled elsewhere on the web. Whether you are looking to increase brand awareness, drive net new traffic or retarget and drive customer loyalty and AOV, Google and Facebook have myriad advertising options available. Of course, with so much opportunity comes a cost. Visibility isn’t cheap. PPC advertising is equal parts art and science. Earning consistent and cost-effective sales from Google and Facebook isn’t necessarily easy — but when you get it running smoothly, it pays off big time. These channels require on-going optimization to churn out return on ad spend at levels of 595% (as seen in the apparel industry for optimized Google Shopping ads) or the 14.2X return on ad spend some companies like Spearmint LOVE see on Facebook. To help you optimize your Google AdWords and Facebook PPC advertising campaigns from day one, I sat down with two analysts from CPC Strategy — Lewis Brannon and Jason Bell — who work with Fortune 500 brands to optimize their campaigns on a daily basis. We talk through Google Shopping, Google AdWords and Facebook Prospecting and Retargeting. If you want to see more ROAS from your advertising efforts, you must heed the advice of these two. Below is the conversation I had with Lewis and Jason where they explain exactly how they work with retailers to get these results. BigCommerce: What’s your #1 piece of advice for helping retailers optimize their Google Shopping campaigns? Lewis: One of the biggest priorities in optimizing Google Shopping –– and what seems to be one of the biggest pain points is getting a feed set up that is accurate, complete and not riddled with a ton of errors. The healthier the feed, the better chance you have of solid performance on shop, just because that’s basically the life blood of your shopping campaigns. Your campaigns can be built out with different types of targeting, but if you only have 5% of your products plugged into an accurate feed, then you’re obviously not going to see really good results. That’s a pretty drastic example, but having a healthy feed, I think, is really, really important. If you already have a healthy feed, the next priority is understanding ways to optimize that feed for search intent. To alleviate feed issues, Google partnered with BigCommerce to built an app that keeps a retailer’s Google Shopping feed up-to-date with accurate product information. Read more about that app here. BigCommerce: Could you give me a few components of healthy feed? Making sure that pricing is accurate, your URLs are working –– both from a URL to product, as well as the image. Your descriptions aren’t just duplicates of your titles. I have seen that happen. Instead, you need to optimize titles and descriptions differently to include keywords that are very important or relevant to the product, or even features of the product. That’s going to help improve your searchability and relevancy on Google Shopping for your products, and improve your click-through rate, cost-per-click and cost-per-acquisition numbers. So accuracy is important and so is, from an optimization standpoint, being able to provide data that is complete and relevant to the products. BigCommerce: And that data you provide should take into account search intent, correct? Lewis: Yes, your title, description, and product type should mimic a user’s search intent. So if you’re selling, say, Nike shoes, you want to include Nike as a brand in Google Shopping, because that’s important to a searcher. You also want to include the size of the shoe, for example, because people might be searching for that. The same goes with the the color of the shoe, and the style name of the shoe. Anything that might be important for people searching for that shoe, you want to include. Your title, description, and product type should mimic a user’s search intent. For some people, maybe for that shoe they would search for “Nike weightlifting shoe.” That’s something that happens. So you want to make sure that “weightlifting shoe” is somewhere in either the title or the description if you’ve pinpointed that it is a keyword that’s really relevant. That keyword would actually improve the relevancy of your product in the shopping feed to what someone is searching. Similar to what a keyword would do in your ad copy for text. Jason: I think the best way to summarize that would be: aligning your product feed attributes with the search queries data. BigCommerce: Where would you suggest people get search query data from? Jason: There’s a couple of places. Your current text campaign. If you’re running a PPC campaign, then you have a clear idea of what keywords are your top performers. That’s a great place to look. Look at your actual search queries reports in AdWords for both your text and your shopping campaign. One that I also implore users to look at is the site search data in Google Analytics, if you have that enabled. This will help you see what people are actually searching on-site. BigCommerce Analytics offers on-site search statistics and relevant keyword data out-of-the-box. BigCommerce: Is there a particular process or set of tools you guys use to measure optimization lift on campaigns? Jason: We really just try to benchmark the campaigns when we get in. When we take over an account, we look at the performance of the campaign or campaigns themselves in Google Shopping. Then, we benchmark the performance when we take over. Next, we try to optimize the data feed using our standard best practices, which would be all of the housekeeping things we just talked about: making sure that you have relevant titles, descriptions, and categorizations, and making sure you have all of your attributes correct and that they’re not throwing errors. Pour over search queries reports and the site search report to figure out what people are actually searching for. Phase two is really pouring over the search queries reports, and the site search reports, and figuring out what people are actually searching for. Does that or does that not align with how we are currently titling and describing the products in our feed? Then, when we make those adjustments, we measure the impact holistically on the performance of the campaign. It’s all just a matter of benchmarking and testing and following up. There’s no one tool that we use that measures that lift. Lewis: We look at it more in terms of understanding the metrics. If we can get a lift in organic search for the brand and are not having to spend as much on ads, we see an actual drop in the CPC. That’s an improvement from a relevant standpoint –– both on-site and in the feed itself. In general, some of these strategies may cancel a couple others out. So, instead, we like to benchmark performance and check in on paid campaigns holistically to see how they are doing as a whole from one timeframe to another. Varying opinions, all great A/B tests. Find which method works best for your business. In May 2016, Google announced what they are called the biggest update to ad creative since the introduction of AdWords more than 15 years ago: Expanded Text Ads. With a nearly 50% increase in text space, advertisers now have the ability to highlight products or services more extensively than ever before. Here is how Lewis and Jason recommend online retailer’s think through their Google AdWords strategy for lead generation and selling your products. BigCommerce customers can download the one-click app to begin advertising on Google AdWords without having to drop any code for conversion tracking (it’s included in the download). BigCommerce: How do these strategies change when you’re looking at Google AdWords instead of Google Shopping? Lewis: When we talk about optimizing titles and descriptions, we’re really only referring to the product data feed, so that is only relevant to Google Shopping. But it does align to the way you would think about approaching a text ad optimization for a regular search campaign. Obviously, the lifeblood of text campaigns are the search queries, just like the lifeblood of a shopping campaign is the search query. That’s the most foundational aspect to both Google Shopping and Google Adwords: understanding what people are actually searching for and what’s triggering your ads currently. It’s the secret to paid advertising. The real difference, though, is that while optimizing titles and descriptions and categorization in the feed is important to improve relevancy for Google Shopping, Google AdWords is more about optimizing the ads and the ad extensions themselves. Does the structure of your campaigns allow you to capture relevant search queries, or capture relevant searches, and trigger your ads against those searches to provide the searcher with the most relevant information? You can think about optimizing titles and descriptions in the Google Shopping feed the same way you would think about optimizing ad text and ad extensions in Google AdWords. Jason: And even ad copy, because your feed and that product itself is essentially the ad. There is no creating a text ad like you would in your text campaign. The product page with your product is the ad. To take our example from earlier, that Nike shoe, needs to be optimized for search intent queries even in AdWords or text ad form. So, say we optimize it for Nike weightlifting shoe. Then, you need to make sure your landing pages for that product are similar to what you’re advertising. Is this product page or landing page for the Nike weightlifting shoe? Do I have those keywords in the title? Do I have them in the description? You do that same type of optimization between both Google Shopping and AdWords to create relevancy between the ad and the page they land on next on your site. When Google offers advice, we listen. Here’s how one Google Shopping executive recommends retailer’s use AdWords. In a budget strapped business, many online retailers are looking to save PPC dollars wherever they can. With Google Shopping and AdWords offering myriad options –– one question came to mind: which one should retailers prioritize? The ultimate answer is … Google Shopping. But there are plenty of reasons Lewis and Jason recommend retailers continue to use both options simultaneously. BigCommerce: Is there a time that you guys would recommend brands use either Google Shopping or Google AdWords exclusively? Lewis: No, I wouldn’t recommend that. I recommend using both. It really depends on your budget, though, as well as on the performance of the campaigns. What we tend to see across the board is that for non-branded or generic type of searches, Google Shopping tends to perform better. It tends to produce a better lead quality. If we’re working with a brand, let’s say the brand is Brixton, and if someone is including the brand name in their search, then that’s obviously a search we feel like has a high probability of converting. That should convert well both on text ads and Shopping. For non-branded or generic types of searches, where the opportunity is large to actually acquire new traffic, we feel that Google shopping converts better. This is because the ad itself is an image showing a product. It shows a price, and it shows a description. Someone clicking through on that has already vetted the product better than someone that is just clicking on text ads. For non-branded or generic type of searches, Google Shopping tends to perform better. That’s why we tend to consider Google Shopping a better lead quality. The data from there has shown it to convert better. In general, we rely a little bit more on Google Shopping for a new customer acquisition and generic type searches. We also rely on it for categorical type searches. For instance, someone just searching for “snap back hats.” Anything more generic does better on Google Shopping than Google AdWords. That said, you can have really good success with text ads also. We don’t recommend not running text ads. If we have a client that has a very limited budget and we have to choose, we’d generally lean toward Google shopping before we would go to text ads. However, if budget is not an issue, we like to run both. Having a shopping ad and a text ad on the page at the same time for a given query is best because it gives you more real estate. Having both gives you more opportunities to win that click. Jason: I’m from the same thought process as Lewis there. The major thing I like to call out with Google Shopping is that price is very important because people are seeing the prices of your competitors at the same time. If you have a much higher price, there’s a higher chance that you’re not going to get the click and not get a conversion on that product. Of course, I would never say don’t run Google Shopping campaigns at all. Instead, it’s a matter of adjusting your bids and making sure that you’re more competitive. In terms of Google Shopping versus Google AdWords, as Lewis had mentioned, it’s really based on what their budget looks like. After we understand what their budget looks like, we look at what features they offer their customers. Are they really competitive with pricing or are they more so competitive with an enhanced service offered to their customers? What puts them ahead of the pack? From that point, we decide where should spend more –– text ads versus Shopping ads –– based on the biggest opportunity for their particular feature set. Facebook Advertising is the Holy Grail for many selling online, including enterprise brands and small businesses. Whether you are still trying to figure it out or have optimized it entirely to drive nearly all of your sales and conversions –– Facebook is powerful, and it isn’t just your gut saying so. Of course, since 2015, Facebook Advertising costs have increased 247%. That makes this channel an expensive one to play in. But, the return on ad spend may very well be worth it. After all, a 14.2x ROAS can result in a 12x increase in revenue YoY. Here’s what Lewis and Jason have to say about optimizing your Facebook Ads to really attract your target audience. Everything you need to know about what founders Shari and John Lott did to turn Facebook into advertising gold. BigCommerce: We just did a survey of about 550 BigCommerce customers, and social advertising is where they see the vast majority of their success and revenue coming from this year –– specifically Facebook. What are some of y’alls top tips for Facebook advertising? Jason: We always start with the lowest hanging fruit, or highest conversion campaign, which would be dynamic product ads. They are also known as DPAs, and we try to set those up for all of our clients. Every single client that we manage Facebook for is running dynamic product ads. DPAs are just a given because those are based on products that people interact with on your website. You can serve the user a specific product ad that is a retargeting of products they’ve already viewed on your site. Those tend to convert really, really well. That’s my first recommendation. BigCommerce: Facebook is known for its targeting and retargeting capabilities. How do you guys think through that? Jason: We segment our campaigns based on retargeting and prospecting. We generally have very different measurement criteria for those, but we do standard retargeting with static ads. Those are called website cards and look like a regular Facebook post. We run those as a retargeting ads. We also segment audiences in different ways. Speaking generally, we like static banner or static retargeting ads on Facebook for people that just came to a website, but didn’t interact with any actual product detail pages. That’s one segment. Once they’ve reached the product detail page, they receive retargeting with a dynamic product ad. So we have a couple different tiers of retargeting strategy based on the user’s interaction level with the website. Strategies that work right now to increase ROAS on Facebook. BigCommerce: Are there any other Facebook advertising options you’ve seen work really well? Jason: We also love running carousel ads. We found that generally the carousel ads tend to perform pretty well and get good interactions. I would say that our point of view is pretty strong on advising advertisers to use those carousel ads. Jason: We don’t do that much video because most of our clients don’t have a lot of video assets to use for Facebook. That said, we recommend using video because Facebook is really favoring video. A lot of our clients are trying to ramp up their video efforts on Facebook. BigCommerce: It sounds like all of that is for retargeting purposes. What about if you are trying to reach a new audience? Jason: That’s the other aspect of Facebook which we find the most interesting because of the accuracy and reliability of the Facebook audience targeting. When you’re profiling users that you want to reach through Facebook, the options to target people based on their interests, their behaviors, their income level, their education level, is very accurate. It’s first party data! Facebook is gathering that information directly from the user, and so it’s more accurate than other inferences a platform like Google can make about you. This is actual data that the user themselves has put into Facebook. So we know that the audience profiling information is accurate. In terms of prospecting, we like to run really specific segmentation of audiences and test out different audiences against each other to see what people are responding to. We also like to utilize carousel ads for prospecting, especially for apparel. We work with a lot of apparel brands and lifestyle imagery that really communicates what your brand is all about tends to work really well, as opposed to a very salesy type message. We like to kind of utilize a lot of lifestyle imagery to build brand awareness from Facebook. 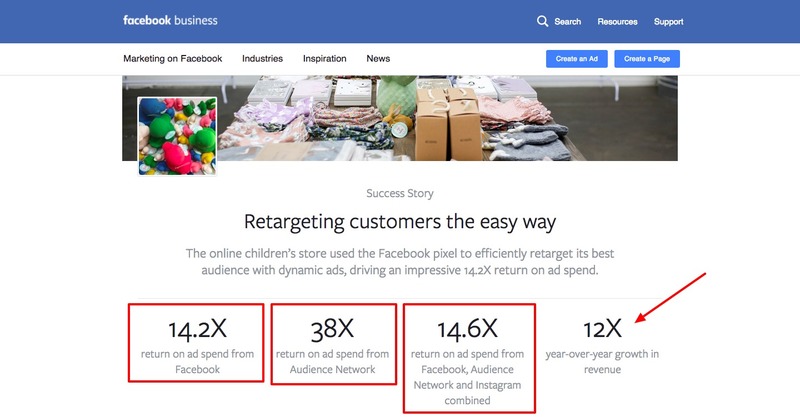 BigCommerce: How do you think through measuring success through Facebook Advertising? Installing the Facebook conversion pixel is vitally important to understanding the amount of actual conversions you earn on your site through your Facebook ads. BigCommerce customers can install a one-click app to install the code without having to touch any code themselves. Jason: The challenge is always measurement, because so much of the conversion data that results from activity on Facebook is not trackable directly. Facebook does a pretty good job of capturing views or conversions, but at the same time, you have to look at a more holistic approach. We try to measure what we call “brand uplift,” which is looking at the holistic performance across multiple channels, including direct traffic, organic traffic, paid traffic, etc. We try to measure and correlate ebbs and flows in those channels to our efforts on Facebook prospecting. For example, we’ll look at our budget that we spent one month on Facebook prospecting, reaching new audiences, and try to see what kind of impact that had on our holistic performance. That’s what we call brand uplift. We try to go beyond the directly attributable conversions that Facebook gives you. What we are trying to do is to go beyond the directly attributable conversions that Facebook gives you, and that you’re analytical tool can give you based on tagging. We try to go beyond that and look at a bit more robust attribution picture to analyze the performance of our social media campaigns. Lewis: We look at brand uplift for both retargeting and prospecting, but we expect to see much more direct response activity from retargeting. With retargeting, we tend to rely much more on the actual channel reporting, like what Facebook and Google can give you in terms of measuring how many actual trackable transactions are coming from campaigns. We tend to look at that first, and the brand uplift metrics are a little bit more secondary. With prospecting though, we tend to look at that brand uplift type of metric first. That’s our main metric. When we look at brand uplift, we also look at new visitors. For retargeting, we’re looking at the returning visitors segment because we want to see people that have been to our website coming back. We want to know if our retargeting campaigns doing a good job of driving people back to the website. BigCommerce: Any final tips for readers? Jason: I think the biggest thing that not only Google has been pushing us to look at, but that we’ve been seeing a lot more success with is not just using your marketing or remarketing list only on Google AdWords. Build out those audiences and add them to all of your campaigns. Bid aggressively on those segments that are higher converting and showing better performance. Really capture the data from users who have already been to your website, or already know your brand, and try to get them to continue to convert. Customer lifetime value and lifecycle marketing campaigns are an important part of advertising across Google and Facebook –– and it’s something we’re seeing Google promote more and more. Lewis: To follow up on what Jason said, it’s about harnessing the power of audiences in search and shopping to supercharge your campaign performance. Audiences traditionally have been used for retargeting only on Google. And even that has traditionally been display retargeting only. But now, there’s a lot you can do with your audiences within your search campaigns and within your shopping campaigns to optimize your ads toward your target audience, and that can be really powerful. Want to learn more about Google Adwords? Check out MainStreetROI’s guide here.